Middlesbrough striker Mido will miss the remainder of the season after undergoing a hernia operation to repair a long-standing pelvic injury. The Egyptian joined the club from Tottenham for £6m at the start of the season but has endured a tough time in his first year at the Riverside. 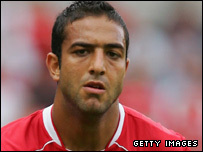 Mido, 25, has struggled for fitness and form for his club and also missed the African Cup of Nations in January. He has started only eight league games for Boro this term, scoring just twice. He was also sent off last month for a high tackle on Arsenal's Gael Clichy. The striker will now miss Middlesbrough's final six Premier League games against Manchester United, Tottenham, Bolton, Sunderland, Portsmouth and Manchester City.